The heartfelt family drama based on a true story is coming to Blu-ray this Easter. 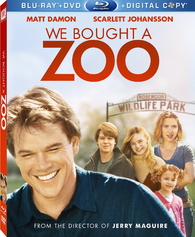 In an early announcement to retailers, 20th Century Fox will be releasing 'We Bought a Zoo' on Blu-ray on April 3. Directed by acclaimed filmmaker Cameron Crowe ('Say Anything,' 'Almost Famous,' 'Jerry Maguire') and starring Matt Damon ('Contagion,' 'True Grit'), Scarlett Johansson ('Iron Man 2,' 'Vicky Cristina Barcelona') and Thomas Haden Church ('Easy A,' 'Sideways'), 'We Bought a Zoo' is “a sweet-natured tale…that you’ll want to see with your kids” (Liz Braun, Jam! Movies). The Blu-ray will feature 1080p video, a DTS-HD Master Audio 5.1 soundtrack, and supplements will include: Audio Commentary with Director Cameron Crowe, Star J.B. Smoove and Editor Mark Livolsi; Deleted and Extended Scenes; Gag Reel; The Real Mee; We Shot a Zoo; and Their Happy is Too Loud. You can find the latest specs for 'We Bought a Zoo' linked from our Blu-ray Release Schedule, where it's indexed under April 3.